Well, sometimes dressing makes the salad. Really. This is a simple pasta salad. It's colorful enough with the noodles, tomatoes, peppers and yellow zucchini. It's a filling, satisfying salad to be sure, but otherwise unremarkable. But read on! What sets the Mezzi Rigatoni and Kidney Bean Salad recipe apart is the dressing for this salad. The mingling of flavors with dry mustard, garlic and dill - along with the vinegar and oil to add a little zest - make this salad a very well dressed choice. Serve with toasted pita wedges with olive oil to dip in, or even a roasted red pepper hummus. Add some fresh fruit and you have a very nice plate! Try it - you'll like it! Combine all dressing ingredients in a small bowl. Mix well and set aside. Cook pasta al dente, according to package directions. Drain and rinse with cold water. 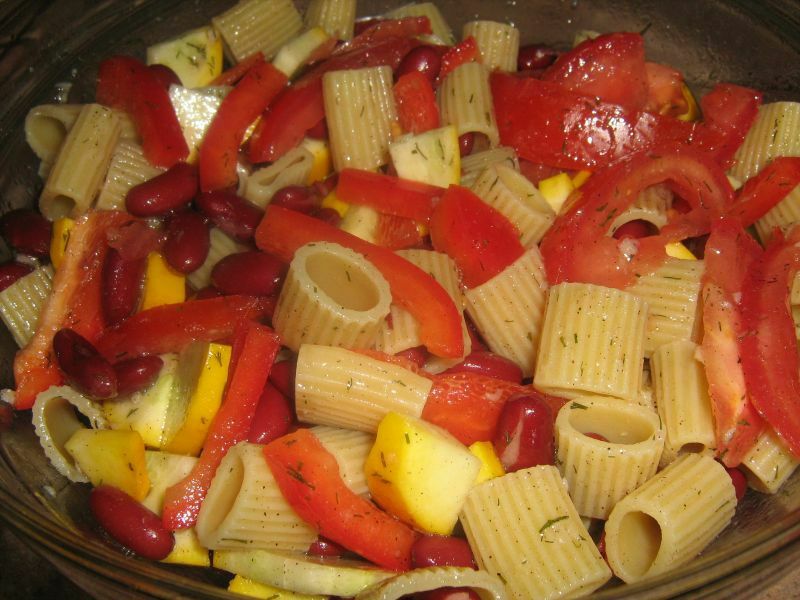 In a large bowl combine the pasta, peppers, kidney beans, zucchini and tomato wedges. Pour the dressing over the salad and toss gently to coat. Sprinkle with nutritional yeast if using. Per serving: Calories 400, calorioes from fat 150, total fat 19g, saturated fat 4g, cholesterol 10mg, sodium 460mg, total carbs 45g, dietary fiber 7g, sugars 4g, protein 15g.